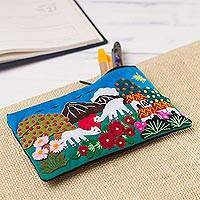 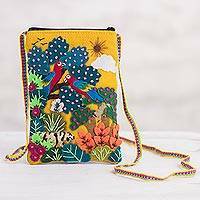 Peruvian artist Maria Ramos Sanchez crafts a charming cosmetic bag whose scene transports us directly to the Andes on a calm, sunny day. 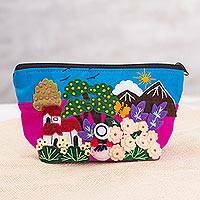 Small homes nestled among trees and flowers accompany grazing alpacas, while a single cloud and a flock of birds float overhead. 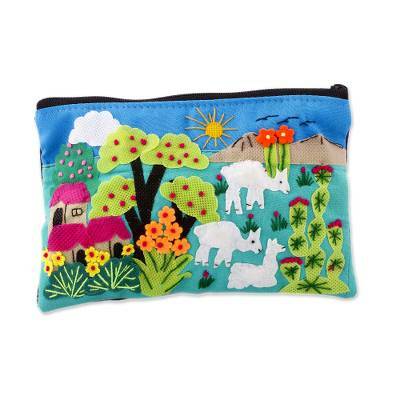 The applique case with embroidered details is lined in solid black, and the reverse side is black.